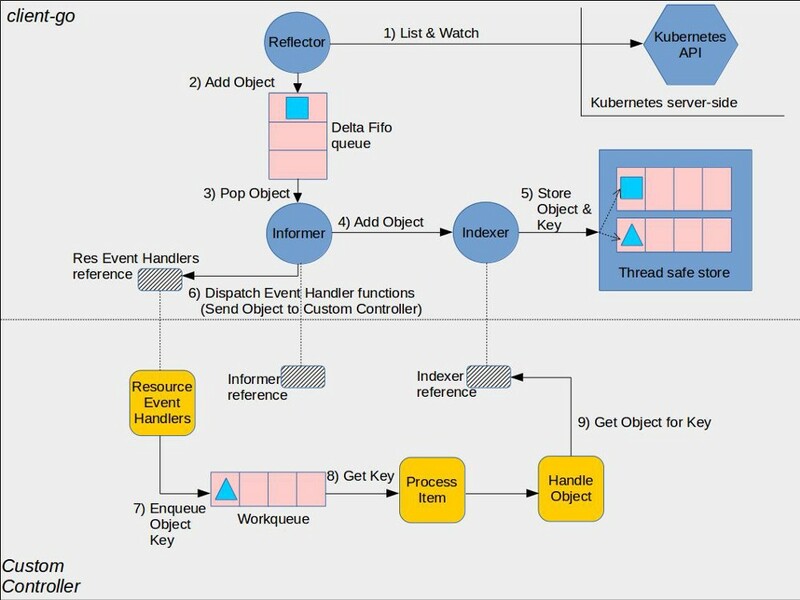 using the Kubernetes APIs and kubectl tooling. - packaging (Helm can use to package multiple k8s apps, that will be deployed and managed by their respective operator). of application. (particularly stateful applications). Operator does all these without data loss and without application unavailability. * Operator is like = Custom Resource Definition CRD + its controller. Here the custom resource is application instance. * Operator is like = A set of cohesive APIs to extend K8s functionalities. * K8s manages K8s objects. With operator, k8s manage multiple application instances across multiple clusters. * Operator takes human operational knowledge (Read : DevOps Team's knowledge OR Site Reliability Engineer's knowledge about application lifecycle) and put it into software to easily package and share with consumers. * Here controllers have direct access to K8s API. So they can monitor the cluster, change pods/services, scale up/down and call endpoints of the running applications, all according to custom rules written inside those controllers. * Out of 4 najor modules of controller code generator (1) informer-gen and (2) list-gen modules are also called operator. They build basis of custom controller. to enable the desired state to be reflected in your application. As the application gets more complicated with more components, detecting these changes can be harder for a human, but easier for a computer. * For PodSet, primary resource is PodSet itself and secondary resource is pod. PodSet will be developed, that is similar to ReplicaSet. Controller works like this pseudo code. Reconsile() is major function of controller. K8s without operator simply create new pod. Controller does application specific code in addition to pod creation. gen-go and CRD-code-generation are also another tool to generate code. Last two are also called operator. They are basis for building custom controller. Notification loop declare and describe desired state. Controller will find out how to reach there. CoreOS provides sample operators as reference like (1) etcd Here is blog (2) Prometheus. Here is blog. K8s exports all of its internal metrics in the native Prometheus format. Here two third party resources (TPRs) are defined: Prometheus and ServiceMonitor. 1. K8s operator are under which namespace? 2. Operator can be developed using Python? - powerful abstractions to make services available in a Kubernetes cluster. Developers can focus on the applications without the need for managing complex services deployment. Service Catalog is list of (1) service class (or service offering) E.g services : database, messaging queue, API gateway, a log drain, or something else. Services are associated with (2) service plan The service plan is variant of service in terms of cost, size etc. Service configuration options using JSON schema to configure service and plan. Automatic form building is also possible. 1. Service breaker handle interactions from modern cloud native apps to legacy system for valueable data stored at legacy system. 2. OSBAPI allows interactions with multiple cloud provider. These are secure APIs. Service broker implements OAuth etc on interface with application / container / platform. a service broker proxy can be used to support custom authentication flow. For time consuming provisioning and deprovisioning, OSBAPI supports asynchronous operation. The service broker first register with K8s. K8s platform is like client software, that request service broker. The first request may be to get service catalog. Then K8s platform will ask to create new service instance. on-demand : service instance is provisioned, when requested. multi-tenant : service instance are pre-provisioned. The service instance will be bind to K8s application/pod using Service Bindings. Typically, a Service Binding will also provide credentials and connectivity information (IP and port) to the application to access the Service. These credentials will be managed by K8s as secrets. Here, service catalog is K8s resource and it has corresponding (1) Service Catalog Controller and (2) Service Catalog API Gateway. The end-user will interact with Service Catalog API gateway. The gateway will ask service broker to list out all the services (service offering/class + service plan). Then K8s will update (remove duplicate, add, delete, modify) the master service catalog and respond to application/platform client. 3.1. Here we can not specify path on host. It is similar to earlier approach. Here we just specify the name to volume. Earlier instead of creating volume, data container was used. 5. we can specify volume of other container, even if the container is not running. * Remove parent docker docker rm -v If the volume is not referred by any other container, then it will be removed. * Volumes linked to user specified host directories are never deleted by docker. - Cost effective due to economies of scale. - Boilerplate code for integrations with message broker, etc. * One can have shared database among all services OR database per service. The correlation ID helps to understand flow of events across services. 2. OAuth2. About resource access and sharing. Next panel discussion was on "Society 5.0 : Moving towards smart society by Japan". The investment in infrastructure projects needs patience, while US investors are impatients. So Japan is better choice with its excess capital. In Bangalore, all metro project, sewage project etc infrastructure projects are funded by Japan. Human species evolved from hunting to agriculture to industry revolution. Japan had huge contribution during the industry revolution with its unique quality processes/tools etc. Even today they are applicable in software/IT industry as DevOps practices. India's strength is neither manufacturing nor hardware. India strength is knowledge. Its skilled, English speaking manpower in knowledge driven industry of today's. India also has massive data for machine learning of around 1.2 billion UID. China has even more data, but under full control of government, so no use. "Bengaluru Tokyo Technology Initiative" is worth to explore. Bangalore is hub for technology, efficiency and entrepreneurship. Japan welcomes Indians. Dolphin tank is an interesting initiative at Bangalore. It proposes to mentor and guide the start-ups through the next stage of journey for 6 months. Just like the dolphin who is a friend in the ocean, Dolphin guides the person through the journey in the rough sea till the person becomes independent. India had cost arbitrage earlier, now India has skill arbitrage. Large organisations depends on India for innovation. Now such organisation does not increase head count at Indian center. They effectively utilizes the startup ecosystem of India. 3. Software = Algorithm + data. Software takes action based on them. It requires risk taking attitude for testing and trial for IoT project. German has more corporate culture. An average German person is skillful in analog, slow and perfect in engineering. While India has startup culture, risk taking attitude, software skill etc. So both are supplementary to each other. "Who is better? A German leader or Modi?" "Nelson Mandela." It is possible to write book / biography by "ghost writer" using NLP based software. Panel discussion about "Geospatial innovations in the times of disruptive changes by KSRSAC" Karnataka Geographic Information System is worth to explore. Geospatial analysis and deep learning based GeoAI are also interesting fields. Bharat Lohani explains, how his company Geokno use LiDAR technology to capture data. They cover 300 square km per day. They have developed alogrihtms, that can detect terrain even in dense forest. They can detect wild creatures in forest. they can detect water channel, very useful to divide water between two states and to help better irrigation. They can create 3d maps. The shadow analysis throughout a day, is very useful for establishing solar energy plant. One more interesting talk by Laxmi Prasad Putta from Vassar Labs. Panel discussion about " Emerging Technologies areas in the Indic language-technology Industry by FICCI". Vivekanand Pani talked about his company Reverie Language Technologies's product "Gopal". It is a virtual assistant that can speak many Indian languages. Thirumalai Anandanpillai mentioned that Microsfot's Azure cloud exposes we service API for speech to text for Indian languages. Vinay Chhajlani's WebDunia.com turns 19 years old company in September 2018, who survived through dot com boom. In 2014, DNS was supporting 15 different languages. In 2019, Kannada will be also added in DNS, that is called IDN (International Domain Name). In the world 20 % people knows English and in India 12 % people knows English. So IDN is needed for non-English domain name. On 1st May 2018, a legal framework for Indic language was established. Since 2014 Gmail supports IDN based e-mail addresses. 4 million users uses Hindi email address by Rajsthan Government. Today more Internet data traffic is about entertainment content. However it will change, as government will give more online services in regional languages. The emerging opportunity is driving emerging of technology. In year 2010, VCs thought that Indian language speaking customers has no money so they were reluctant to invest for such language based startups. 22 years ago, we had only 1 % of PC penetration, so no need of Hindi. In 2010, 50% of mobile penetration, so Hindi was needed. So in 2011, first mobile phone launched with Hindi supports. Today many people are first time Internet user with mobile. In 2002, the way people were behaving at Yahoo chat room, today this first time user may behave same way. During QA, I asked about Sanskrit, Sage Panini's Sanskrit grammar and its relevant with NLP. Everyone nominated Thirumalai Anandanpillai from Microsoft to answer the question. May be because he has nice TILAK on his forehead. He replied, that today translation happens by Neural Network. It is not rule based. Panini's grammar is relevant and useful for rule based services. So overall "Bengaluru Tech Summit" was worth to attend event, with many thought provoking ideas, updates about recent trends, startups and insight to upcoming futures. There was also exhibition with stalls from established companies and startups both.